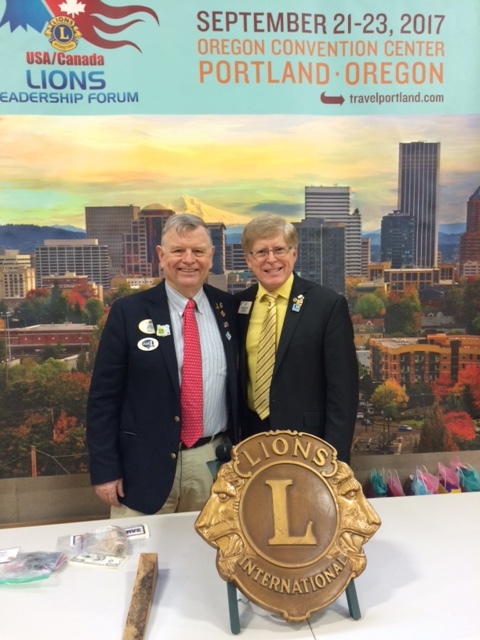 When Kathy and I left for Portland, Oregon, we were excited to see the Lions we met last year and make new friends in the City of Roses. Portland is known for its beautiful sites, with Mount Hood and Mount Saint Helens in the horizon. 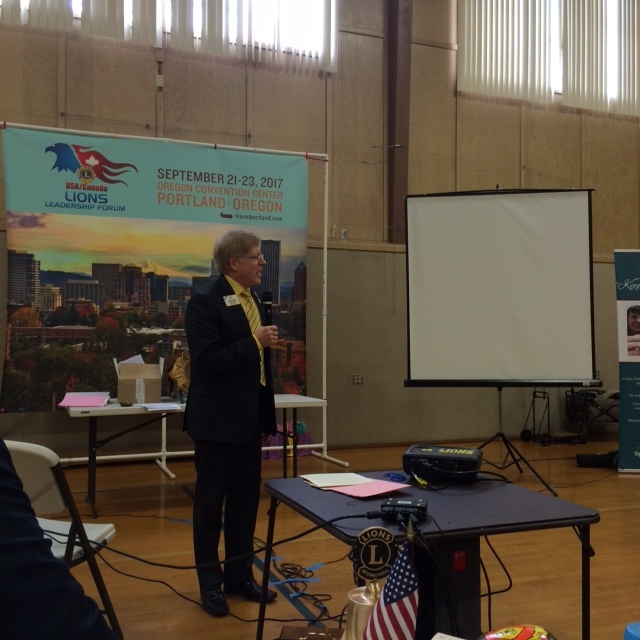 However, we were also excited because Portland is the site of the 2017 USA/Canada Leadership Forum. From our vantage point, this committee is already on track to offer a spectacular Forum in 2017! 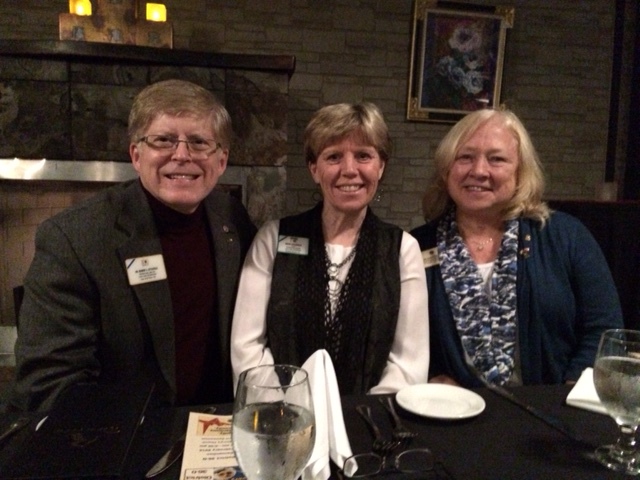 We were so pleased to have the opportunity to visit District 36-O and represent Lions Clubs International at the mid-winter conference. We can only describe the conference as a “love fest” because everyone was so welcoming and supportive. 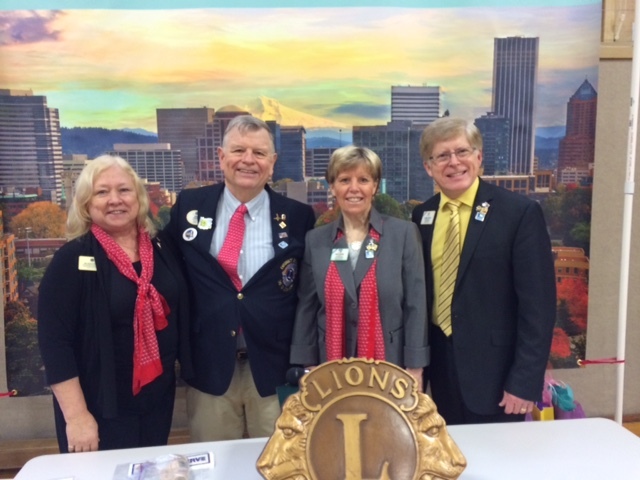 Past International Director Dr. Sonja “Sunny” Pullen was our host and she certainly let the Lions of Oregon know that she was pleased we were able to come. It was great to have the opportunity to get to know her better . . . and, we learned that she served on the International Board with another woman, 2nd Vice Presidential Candidate Gudrun Yngvadottir! District Governor Henry “Hank” Calhoun and his wife Lynn were gracious and provided very positive leadership for the event. DG Hank understands the importance of recognition to congratulate emerging Lion leaders for all of their hard work; and his positive attitude and appreciative style made for a very enjoyable conference. Upon arrival, I was immediately introduced to the District Cabinet and spoke about the importance of inviting people to serve with Lions, and sharing with them the benefits of membership. The good news for District 36-O is their chartering of a new club this year and their focused efforts on ending the year in the positive (net growth). After the meeting, DG Hank and the local convention coordinators arranged for a very special welcome dinner at the Riverview Restaurant in our honor. The attendance surpassed their expectations and they even had to add a table to accommodate the guests. The food was delicious and we had the opportunity to meet and really get to know many of the Lion leaders. On a personal note, we shared many stories about Norway and our common Scandinavian heritage. Uff-da! Saturday was a full day for us, but the programs that were scheduled complemented the messages Kathy and I were prepared to share. Information about the Centennial, important organizational planning for the USA/Canada Forum, and leadership training were the main topics of the morning. 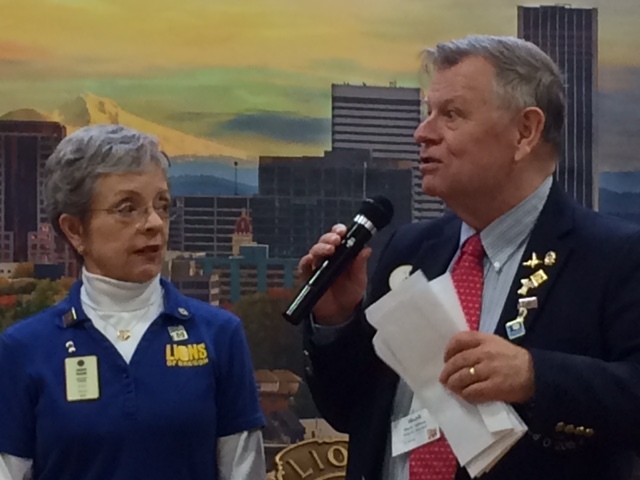 PDG Sharon Rollins chairs the District LCIF and Centennial efforts. Kathy and I presented our program on the Lions Club International Foundation’s One Shot, One Life Measles Initiative and the Lions of District 36-O generously donated $740 to the cause. These individual donations are so important because they demonstrate the recognition and importance placed upon the work of the LCIF and this vaccination program by Lions at the grassroots level. The convention planners held a silent auction and clubs entered their baskets in a competition for “the basket that generated the most interest” and “the basket that represented the theme (It’s a great day to be a Lion).” This silent auction was really well done, and I had the opportunity to serve as one of the judges. The basket that generated the most interest was a smart traveling suitcase filled with goodies (plus, a $100 bill). The basket that represented the theme used Project ALERT and included items that would be needed in times of a crisis situation. Of course, as a risk and crisis communication professor, that one caught my eye! The District ALERT chair raised a good point that disaster relief should continue to be a top priority for Lions as we approach our second century of service. ID Robert presents his message focusing on dignity, harmony, and humanity–the theme of current LCI President Dr. Jitsuhiro Yamada. Another exciting moment for us occurred with the induction of new members. Whenever we have the opportunity to raise up new members and remind ourselves of our commitment to Lionism, it’s a great day! 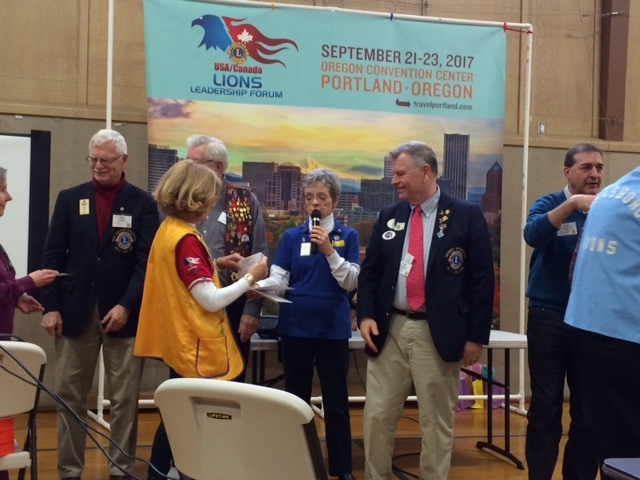 Following the induction, we presented Presidential Certificates of Appreciation to Lion Bert Diamond (Portland Bentham Lions Club), Lion Carrie Bartley (Milwaukie Lions Club), and Lion Raema Manning (Lake Oswego Lions Club). 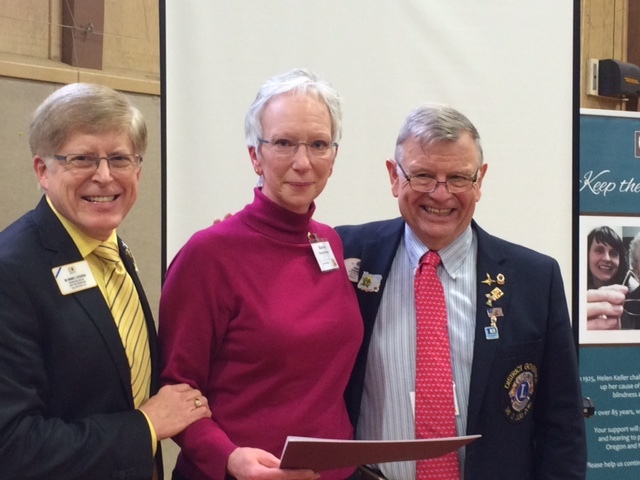 Certificate of Appreciation presented to Raema Manning of the Lake Oswego Lions Club. 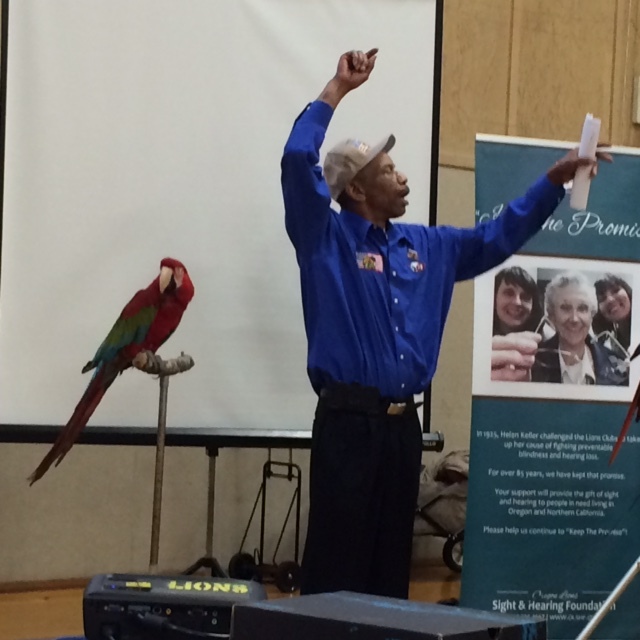 The final program of the day was an innovative partnership between veterans, Lions, and exotic birds. 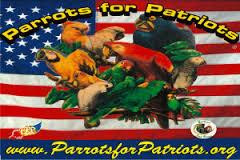 Christopher Wiggins is a veteran who has developed “Parrots for Patriots,” a program where exotic birds are partnered with veterans. 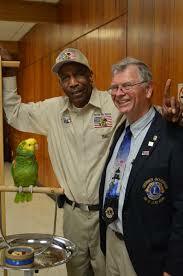 Exotic birds live long lives and are very sensitive and strongly bond with their owners. Exotic birds that are abandoned often go through separation anxiety and demonstrate self-mutilation. Similarly, veterans experiencing PTSD often need someone or something to care for and to give purpose and meaning to their lives at times of personal anxiety or stress. This program brings the two together and the results have been overwhelmingly positive. On Sunday morning, District Governor Hank drove us to the airport and were on our way back to Minnesota. We have so enjoyed the variety of locations and the time we have spent with Lions across North America. Our gratitude about this wonderful opportunity is beyond words. Next stop, Indianapolis and District 25-C. At this convention, we will have an opportunity to reconnect with a Lion protégé, Sarah, who began as our student and has become “one of the family.” We will also be joined by ID Linda and Vern Tincher of Indiana and look forward to spending some time with them in their home district. To all who serve, best wishes!